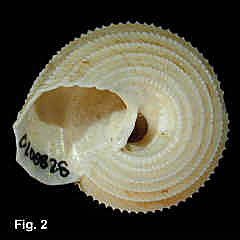 Description: Shell lightweight. Body whorl bears four or five approximately evenly spaced spiral ribs between suture and periphery, the top two or three bearing widely spaced rounded beads, the bottom two being more densely beaded; the whole bearing dense, fine oblique lamellae. Basal margin rounded, base with 4-6 very closely beaded ribs. Umbilicus wide and deep, margin beaded. Columella smooth, outer lip thin, showing the exterior sculpture internally. Colour uniformly white. Interior nacreous. Size: Up to 20 mm high, 24 mm wide. Distribution: Endemic to Australia; Coolangatta, Qld, to Ulladulla, NSW, at depths of 329-725 m. Common. 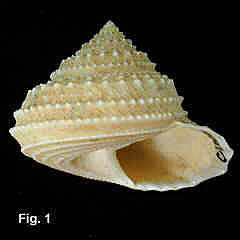 Remarks: This is one of the most common shells on the NSW continental slope. From its description in 1879 it was rarely seen until fisheries investigations began on the continental slope in 1971, but it is now commonly obtained by commercial trawlers.